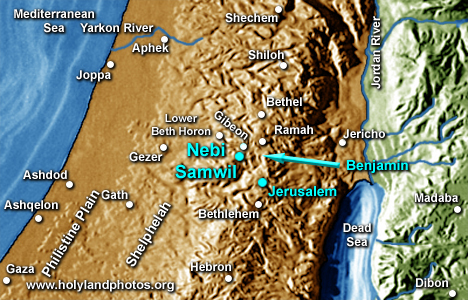 Nebi/Nabi Samwil is a hill located 5 mi. [8 km.] northwest of Jerusalem. This prominent hills towers over the Central Benjamin Plateau at 2904 ft. [885 m.]. The remnants of a Crusader Church, later turned into a Mosque, now crowns the summit. According to late traditions the Prophet (Nebi/Nabi) Samuel (Samwil) was buried here—in spite of 1 Samuel 25:1 that places his burial at Ramah, to the northeast of Nebi Samwil. It's ancient name is disputed. Some suggest that it is Ramah (normally IDed with er-Ram), others Mizpeh (normally IDed with Tell en-Nasbeh). I believe that this is actually Gibeah of God where there was a Philistine outpost (1 Sam 10:5) and where Saul met a band of prophets (1 Sam 10:10). It was also called the "high place at Gibeon."